Historically, the village is known for being the "land of good", because of its fountain (Nabeh-el-Barouk). The poet RachidNakhleh, the writer of the national hymn (kullunalelwatan), was born in Barouk. The village is also famous for its apples and other fruits, and for its many forests such as pine trees and oak trees which are well known in Lebanon. 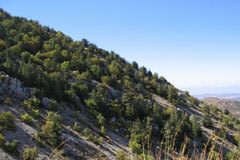 The mountain also has the largest natural reserve in Lebanon, the Al Shouf Cedar Nature Reserve, and contains the oldest and most elegant cedar forest in Lebanon. 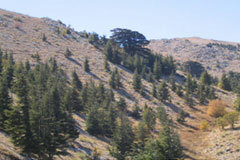 The largest of Lebanon nature reserves, Al-Shouf Cedar Nature Reserve stretches from Dahr Al-Baidar in the north to Niha Mountain in the south. blanketed with oak forests on its northeastern slopes and juniper and oak forests on its southeastern slopes the reserve's most famous attractions are its three magnificent cedar forests of Maasser Al-Shouf , Barouk and AinZhalta - Bmohary in addition to Fakhreddine fortress in Niha. From the summit of the rugged mountains, visitors will have a panoramic view of the countryside, eastward to the Beqa'a Valley, Ammiq wetland and Qaraoun Lake, and westward toward the Mediterranean. The reserve hosts 32 species of wild mammals of which 9 are considered to be rare at the international level (wolves, hyenas, etc.). 270 species of birds, 19 are considered rare at the national level, 27 species of reptiles and Amphibians.